The Hammond Organ, a product of American ingenuity and workmanship, has a world-wide following. Hammonds built more than 50 years ago are still serving home, church, and professional musicians. With proper maintenance, these fine instruments will not lose their original tonal quality. In 1981, we were certified by the Hammond Organ Company, to service their fine products. Currently, we provide maintenance and repair for thousands of Hammond customers throughout West Michigan including the B3, C3, and A100 models. 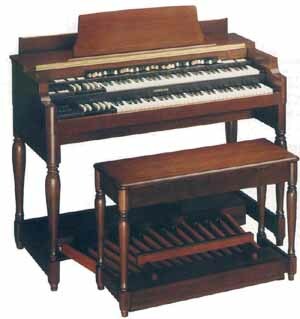 At Elledge Electronic Service, we specialize in the upgrading of older Hammond Organs. Percussion effects can be added to an older BV or B2 model, to achieve a B3 sound. Generator filtering can be improved. Vibrato system can be repaired / upgraded. A modern solid state preamp, with extra features, can replace the original tube preamp. Functional Leslie interface kits can be installed. Modern MIDI features can be added, and MIDI sound modules installed. Classic Hammond Organ sounding great. For all your keyboard maintenance and repair needs.